Thank you for your interest in the 'Loch Class Frigates Association'. The Association started about 1993/1994 as the HMS Loch Quoich Association, but after four years, it was decided that we should accept members from other Loch Class ships into membership. Some ships have their own Association (please check, but remember that you can belong to both). If you served on any of the Loch Class Frigates or their derivatives i.e. the Bay class, Havens, Survey vessels or Admiral's Yachts and you would like to find your 'old ships' then please send a message from the 'Contact Us' page. When the Loch Quoich Association decided to include all Loch Class Frigates into the one Association in 1998, it was agreed that a memorial in recognition of all shipmates that served in Lochs and their derivatives should be investigated. 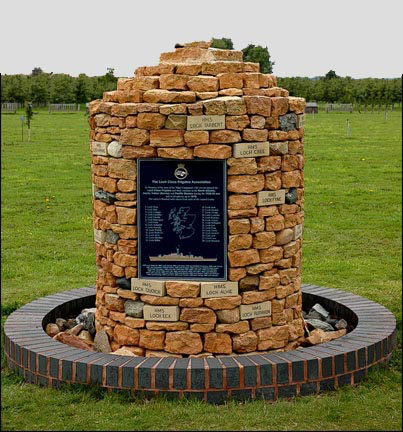 The National Memorial Arboretum at Alrewas in Staffordshire was in its infancy and it was suggested that this would be an appropriate place in which to commemorate the shipmates. 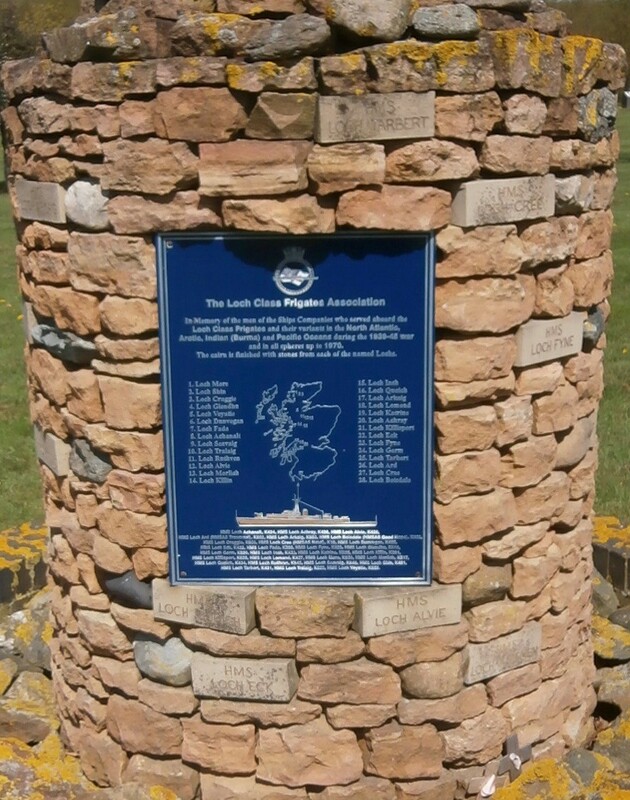 At the annual AGM in 1999 it was agreed that funds would be raised to plant a tree at the Arboretum and a suitable plaque to be made in dedication to all who served in Loch Class Frigates and their derivatives, especially remembering those who had lost their lives in the course of their duties. In April 2000 the Association held a dedication service at the Arboretum with a new tree and the plaque. Whilst the tree was expected to last at least 100 years concern was raised at the AGM held in Babbacombe in 2001 that a more permanent memorial should be created. An estimated target cost of £1,000 was agreed as an appropriate cost to build such a monument and by the end of the weekend over £200 had been donated. At this AGM it was also suggested that as the ships were named after Scottish lochs, it would be appropriate to build a Cairn which would be in keeping with the Scottish theme. This idea developed and it was S/M Ron Blanchard, who lived in Scotland, who put forward the idea that if it could be arranged, it would be appropriate to build the Cairn with rocks from the 28 lochs that the ships were named after. This suggestion was given a resounding approval. Ron on his return home contacted the Scottish Sunday Post who then ran an article regarding the need for rocks from each of the Lochs and within a few weeks Ron was inundated with calls and emails from members of the public who were happy to assist and it wasn’t long before his garden began to fill with rocks over the coming years. An appropriate design for the Cairn had been agreed and a stonemason commissioned, so it just needed someone to transport the rocks once enough had been collected from Scotland down to the Arboretum - no mean task. When sufficient rocks had been collected, Ron approached 45 Commando Royal Marines who are based in RM Condor near Arbroath to see if they could assist. They were only too pleased to help and informed Ron that as soon as suitable transport was scheduled to be going south, they would let him know. Several weeks later Marines Billy Rogers and Stephen Aldridge duly arrived at Ron’s house to collect the rocks on their way to Plymouth and loaded the rocks onto their transport. 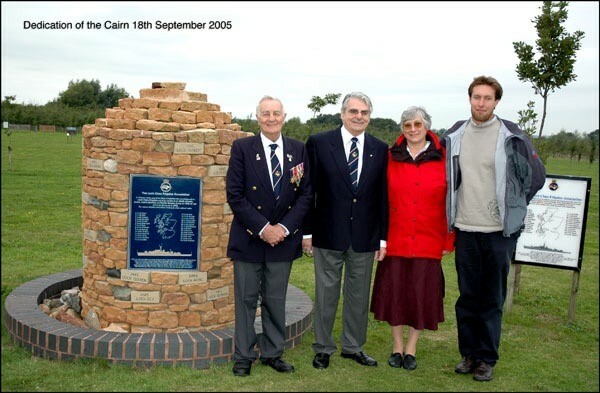 On 3rd September 2002 they arrived at Alrewas and handed over the rocks into the care of Andrew Brown Jackson, the appointed stonemason and drystone wall expert, who was to build the Cairn. Construction of the Cairn was delayed due to a backlog of work Andrew was already commissioned to complete. Construction commenced in the autumn of 2004 and it was finally completed in March 2005 and the Cairn was officially dedicated on 18 September 2005 a fitting tribute to all Lochies and their derivatives. The Cairn has subsequently been featured in much of the literature issued by the National Memorial Arboretum and has gained many praises from visitors to the site. Vice President Ken Wood, Chairman Arthur Bardsley, Mrs Brown –Jackson and her son who represented Andrew Brown-Jackson the stonemason who was unable to attend the dedication.